So, a big thank you to Evelyn from Momsicle, Poppy from Funny or Snot, and Krista from Mostly Mommyhood. Eventually, I will post about our cocktails (and they might too…) so stay tuned. In the meantime, I wanted to share the infusion that was the base of our featured cocktail from today’s gathering. Place the frozen blueberries in a small saucepan. Crush them lightly (I used a pastry cutter). Lightly cook them on low for about 5 minutes. Remove from heat and allow to cool completely. This amounted to about 1 cup of a gelatinous blueberry goop. After the blueberries are cool, place all ingredients in a quart jar (or larger). Shake and allow to infuse for at least 4 weeks, stirring or shaking occasionally.When it has reached your desired taste, Strain and Filter through a colander, cheesecloth, jelly bag, and coffee filter. I got some of the inspiration for this liqueur from Post Prohibition. He recommends using frozen berries because of the organic breakdown of frozen fruit (or something like that… I was willing to give it a try) and also lightly cooking the berries. The flavor came out great. I really love blueberry pie, so the intent was to include a few spices that you might find in a blueberry pie. It is delicious! I have not yet tried making a blueberry liqueur with fresh berries, but have had a few blueberry infusions that tasted quite weak. I wanted to make sure we didn’t fall into that trap. The result was great. Categories: Infusion, Liqueur, Recipes | Tags: blueberry, cinnamon, clove, gin, lemon, Liqueur, recipe | Permalink. We’re all alive! Although it’s hard to imagine you killing us with anything other than alcohol poisoning. And that would really be on us, right? But you win the Brave Blogger of Spring award for having slightly off-kilter mothers over to your house for drinking. And since none of us wrote posts while drunk, I think your home address is safe. Although I did steal your credit cards… Seriously, though, your infused liqueurs closet is STUNNING! THANK YOU for the peek. That looks amazing! Must try it out. thanks. This was the first time I had tried frozen fruit, and I really liked the result. You could try it without the saucepan, but you may bot be as happy with the result. I had tried other blueberry infusions that were good, but not AS good. So, it is up to you. You really don’t have to cook them that long… If that helps. This sounds really good! I pinned it to try later. Thanks! Glad you liked my Sour Cherry Brandy recipe. I also make Blueberry brandy but I have never cooked the berries. May try that this year and will try your Blueberry Gin. Lovely site and great recipes! Hi, Alicia. 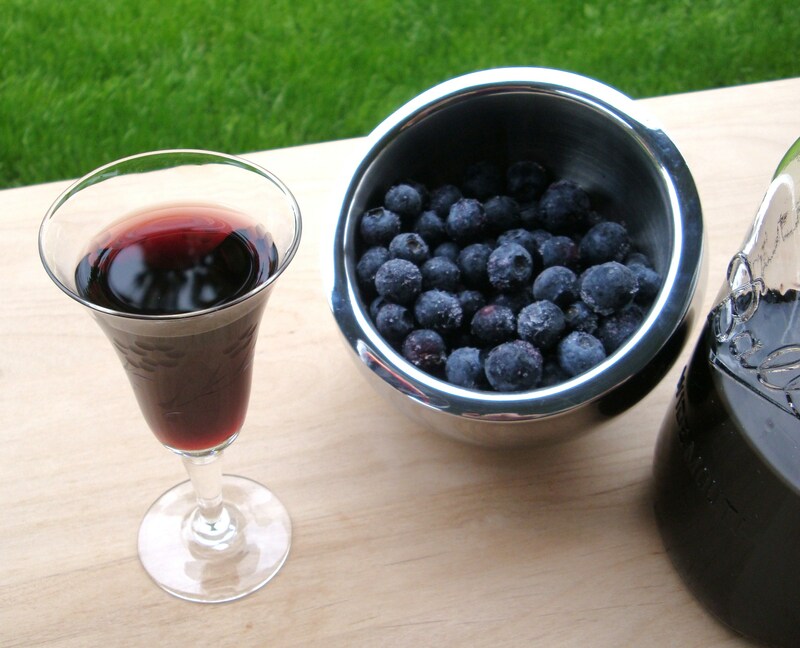 I wrote about Blueberry Gin and Boozed + Infused on atasteofmorning.com this morning. I hope that you like the post! I started a batch today but substituted rum for the gin because it’s what I have. I’m hoping for a good result – it definitely sounds good! I’m dying to try the apple pie bourbon too – that’s next 🙂 I can already tell it’s going to be hard to be patient though!